Recent IPOs: Where is Lending Club Now? Lending Club went public in December, and its share price nearly doubled from the IPO price. What has happened since then? After going public in December, Lending Club (NYSE:LC) shares shot up to about $29 per share. However, since then it has been pretty painful for Lending Club's shareholders, with shares down by more than 30% from the highs. 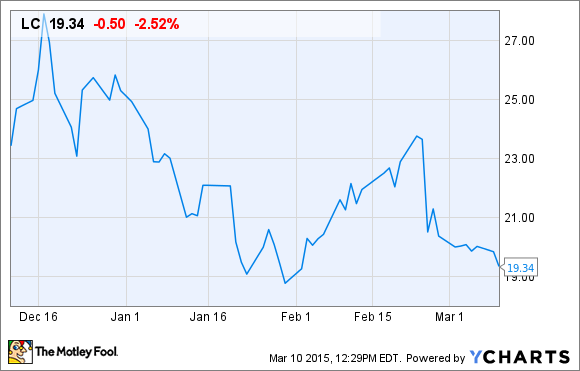 With shares just above the lows, what's going on with Lending Club these days? Is now a good time to get in for those who stayed away from the IPO? Lending Club is a peer-to-peer lender, and the first one of its kind to go public. In a nutshell, Lending Club allows borrowers to request loans on its site by supplying some details about themselves. The company then evaluates the borrower's qualifications and assigns a credit grade that determines interest and fees. Currently, the average interest rate on a "grade A" personal loan is about 7.6% and the average on a "grade G" (the highest risk) is about 25%. Once approved, the loans are listed online for prospective investors to fund, and they can do so in increments of just $25. The investors then receive interest and principle payments on the loans as the borrowers repay them. Lending Club's highly anticipated IPO was considered by some in the industry to be the "coming-out party" for peer-to-peer lending, making the business just as legitimate as big bank lending. Why the drop in price? There are several possible explanations. Sometimes an IPO simply takes a little bit of time for its price to reach equilibrium. Lending Club shares were priced at $15, and then shot up by as much as 65% during its first trading day. After a move like that, a pullback isn't that out of the ordinary. The most recent leg down is mainly due to Lending Club's lackluster earnings results, which were released in late February. The company actually met analysts' expectations of $0.01 per share in earnings, and slightly beat the revenue predictions with $68.1 million ($66.7 million was expected). However, the company's forward guidance is what disappointed the market. For 2015, the company is projecting EBITDA between $33 million and $42 million, short of the $44.2 million analysts had been expecting. It's tough to say whether or not Lending Club is appropriately valued at the current level, simply because it's such a high-growth company and, as such, is essentially impossible to accurately value based on its earnings and projected future earnings. The consensus of analysts covering Lending Club is calling for just $0.06 per share in 2015 and $0.21 in 2016. So, Lending Club currently trades for more than 320 times forward earnings. However, the growth rate is incredibly impressive. Lending Club originated $1.4 billion in loans in the fourth quarter of 2014 -- more than double that of the same quarter in 2013. For the full year, Lending Club originated $4.4 billion in loans. To put that number in perspective, consider that the company originated just $3.2 billion in its history prior to 2014. And the company is showing no signs of slowing down. In January, Lending Club announced partnerships with Google and Alibaba Group, both of which should lead to increases in loan originations going forward. One thing is certain -- there is massive potential for Lending Club to grow. As one of my colleagues recently pointed out, the U.S. consumer debt currently stands at about $3.3 trillion, which means that lending club's share is around 0.1% of the total. To sum it up, Lending Club is definitely a risky, high-growth investment, but it is one that could pay off tremendously if its business continues to grow at such an impressive rate.